Erkut Yilmaz (pictured) topped a field of 280 entries to win the WPT Rolling Thunder Main Event on Tuesday at Thunder Valley Casino Resort. 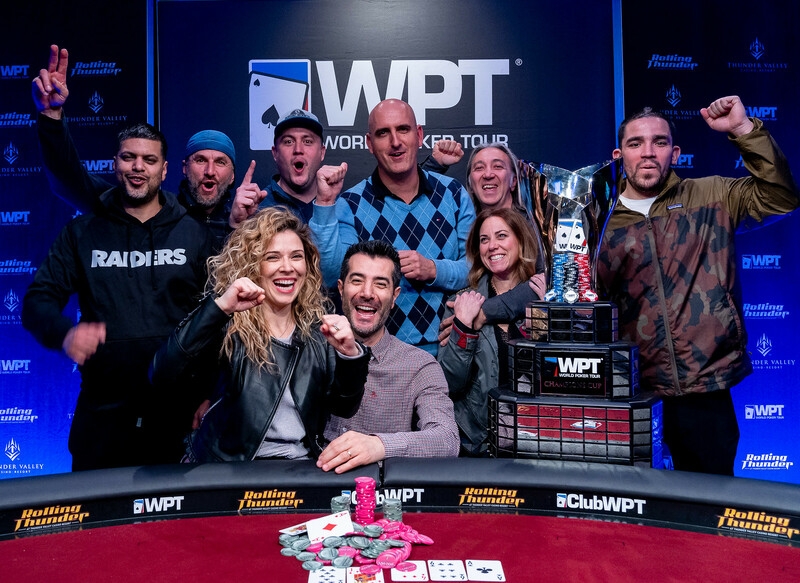 Yilmuz won his second WPT title, and $303,920 in first-place prize money, which included a $15,000 seat in the Baccarat Crystal WPT Tournament of Champions. This is the second WPT title that Yilmaz has won during Season XVII, and he is now the points leader in the Hublot WPT Player of the Year race with 2,300 total points. Yilmaz won his first WPT title at the WPT Borgata Poker Open back in September. The win also took his career live tournament earnings up to $1,870,954. “It was a very tough final table, all the players played great. The heads-up match was long, and he was playing great. I got lucky in a couple of spots and I won the tournament so I’m very happy,” said Yilmaz about the heads-up final he payed against Jim Collopy. “Honestly, I think my wife helps me a lot. When I go on break she always gives me good advice. Every time I go to break and then I come back I start making chips. It’s all positive things from my family, and my friends, and my wife,” said Yilmaz about keeping his focus at the poker table to another round of applause from his rail that was ready to celebrate his big win. Action got off to a fast start today when Jerry Robinson hit the rail in sixth place on the 13th hand of play. Former WPT Player of the Year Anthony Zinno was unable to win his fourth WPT title when he busted in fifth place on the 23rd hand of play. Yilmaz then doubled up twice before Dylan Linde exited in fourth place on the 41st hand of play. Linde did take home 600 points in the Hublot WPT Player of the Year race for his cash, and he is now in second place with 2,000 points total. Three-handed play proved to be a stubborn affair as Ajay Chabra doubled up twice before he exited the tournament in third place. The three-handed battle was a preview of things to come, because Yilmaz and Collopy engaged in an epic back-and-forth heads-up battle to decide who would become the champion of the tournament. Yilmaz started with the lead, but Collopy soon took contorl of the match until Yilmaz doubled up twice. Collopy then scored a double, but the two were nearly even in chips the next time they got it all in the middle. Yilmaz won the penultimate and deciding pot of the tournament, and Collopy was left with just three big blinds after that hand. They got all their chips into the middle one last time on the very next hand. On the final hand, Yilmaz raised enough to put Collopy all in preflop, and Collopy called all in for 400,000. Yilmaz said, “I didn’t look at my cards yet.” The two players then flipped over their cards. Collopy was eliminated in second place, good for $200,780, and that made Yilmaz the WPT Rolling Thunder champion. Yilmaz took home the top prize of $303,920, which included a $15,000 seat in the Baccarat Crystal WPT Tournament of Champions. Congratulations to our new two-time WPT champion – Erkut Yilmaz! That concludes our coverage from WPT Rolling Thunder. Thanks to Thunder Valley Casino Resort for hosting another great stop on the tour. The WPT Borgata Winter Poker Open final table takes place on Wednesday in Las Vegas, and WPT Barcelona is also currently running until March 17 at Casino Barcelona in Spain.